I'll be executing a couple buys this week and I've been looking for some good deals. 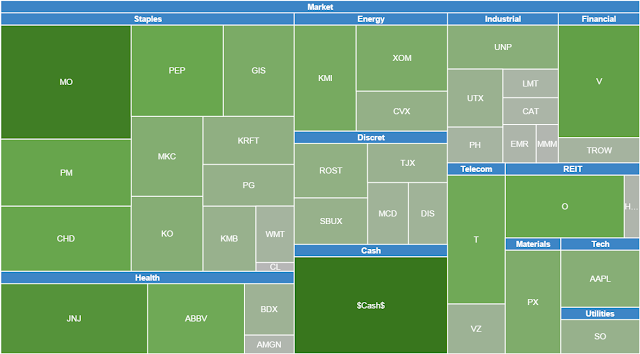 The worst hit sectors at the moment are REITs and utilities. I prefer to buy stocks when the price of the stock is distressed but the fundamental of the business is still solid. Due to the fear of future interest rate hikes by the Fed, many of these interest rate sensitive equities have taken a hit this year. Measure of undervalue or overvalue is done using Fast Graphs. This uses Price / FFO data from past years to find the average Price / FFO ratio. My favorite REIT is O which I still believe is overvalued. however it is approaching its 52 week low. A price of $41 for O will start to get me excited and anything below will be me backing up the truck. Aside from O, I have other REITs I am eyeing. HCP has taken a beating due to legal issues with its largest tenant. I am on the side that believes that HCP will find a way through this mess and believe in the growing need for medical housing due to the baby boomers hitting old age. I'm not too sure about HCP price point since I see it going lower even more but I would hazard to say the best move here is to dollar cost average down. Compared to historical Price / FFO, HCP is very cheap. HCP and O both have very strong credit rating: BBB+. Not many REITs have BBB+ and I don't know of any on my watchlist that has anything higher than BBB+. HCN is attractive to me only when it hits $60. I find it still overvalued The credit rating is only BBB so I don't consider it as core as the two names above. VTR is also a stock I like and it has a credit rating of BBB+ and is undervalued at this time. I find VTR attractive to add at this time. OHI is the last REIT I am watching and it sports a high yield compared to the others. OHI's growth in FFO and dividends have been impressive in recent years. The company appears fair valued at the moment; however, their credit rating is not sufficient enough for me so I will only consider it for speculative purposes. For REITs, I am deciding between HCP or VTR. O and HCN still have to drop more and I will only add to OHI (if I ever decide I needed another spec position) after the fed announced interest rate hikes. For utilities, I am looking to add another name to my holdings. SO right now has a decent % allocated. Otherwise I would look to add more. I am eyeing WEC, PNY, and XEL at the moment. I wish to add to D but I believe it to be overvalued, however this may be due to their potential growth and decently high dividend growth guidance. D's P/E is 26 at the moment and that is just too high for me to justify for a utility company. I can see a P/E of 26 for high growth like Starbux or Visa but not a boring utility. Fast graphs indicates that SO is undervalued, PNY and XEL are fairly valued and WEC is overvalued. WEC will have to fall to 42-43$ for me to consider. All of the utilities listed above have very strong credit ratings and solid dividend histories. I have been doing some shopping for business casual attire lately so I am envisioning a slight decrease in contributions in the coming month. For once, I'm treating myself this time for July 4th. Bought 28 shares of PM around $2320. This will add around $112 in annual income. This company goes ex-dividend tomorrow. A lot of activity will be happening in the coming week. I will finally have accumulated around $2400 in my retirement account and I have spare cash in my taxable account that I need to allocate. I will also have a surge in cash in my taxable account in the coming weeks that need to be carefully allocated. I have decided on a mix of speculative high growth plays and core dividend growth stocks. I have no attachment to stocks and am fine with selling. However, I do not sell often since I prefer having the effects of compounding take effect. These positions are small and I do not like having too many positions in my portfolio so they had to go if they weren't of my liking. Morningstar assigns ROST a fair value of $54. S&P gives a fair value of $55. ROST is $48.5 as of today after the split. This is a double discount that is highly interesting. ROST has increased earnings for many consecutive years including the great recession. ROST's financial status is solid and their debt is low. Their historical P/E is above historical norm but that is due to their exceptional performance. GILD now is offering a dividend and I consider them attractive. S&P gives it a target over $180 and GILD currently stands at $117 with a very low P/E ratio of 13. Morningstar gives GILD a fair value of $114. I see GILD as a strong buy because of its low valuation. I am also looking to expand my holdings in healthcare. I will admit I have missed the bandwagon when GILD was in the $90s. However, it still looks darn cheap from a P/E point of view compared to everything else on the market. I will start with a small position and continue to add if it's still priced attractively. Additional stocks I am considering that are selling at double discount is AMGN ($176 and $189 price targets) and UNP (below fair value according to FastGraphs). AMGN has a yield of 2% and a short dividend history. The P/E is high and I prefer to stick with GILD because of GILD's low P/E. I always wanted a full position in a railroad. I see UNP as best in class and its price has finally come down. The yield is decent at 2.2%. I am loving the fall in price of KMI. I welcome it everyday and will continue to add if it falls more. KMI is now my 3rd largest position. I want more in consumer staples since these companies tap into everyone's daily expenditures. I will always be overweight in consumer staples and will not hesitate to drip to a position even if it's overweight. I have been waiting for a fair valued utility for a very long time. SO is right now undervalued. WEC and XEL are a tiny bit overvalued and PNY is still overvalued. I want all 4 and will have cash on the side to add when they are finally shot down. I am going to use these utility plays plus KMI and PM to expand my total portfolio yield higher. We are approaching the end of the second quarter in 2015. What do you know. It has been already 6 months this year. Since starting my portfolio, the number of positions has grown substantially to 40. I am of the preference to keep things simple and reduce the number of companies I have to continuously follow. I am starting to feel that the number of companies I hold is exceeding the number I would like to manage. My preference in a portfolio is to minimize volatility while maintaining predictable dividend increases and earnings. I have identified several stocks in my portfolio that are not Core to my holdings. Since the SPY is at an all time high, and the interest rate hike seems quite probable due to recent economic indicators, I am of the opinion of moving several of my Supporting positions to Core positions. This will increase the Core positions that I want to hold forever while limiting exposure to risk due to market highs. Core positions by nature are less cyclical than my Supporting positions. I have many Core holdings I am wanting to add at this point and would always prioritize Core holdings over Supporting positions. When a Core holding becomes highly attractive to me, I will use the funds from Supporting or Speculative positions to fund. Many of the Core companies I like are considered consumer staples or defensive in nature. Usually the downturn on average of these companies are much less than the standard index. In 2008-2009, these defensive companies as a whole can see drops from 20-30% as opposed to 50-60%. I am getting uneasy of the market highs at the moment and will prefer limiting my exposure to speculative positions until after a sizable correction. I'll include a picture of the S&P500 right now along with the VIX. My hope is that the SPY will drop below the 200 SMA so that higher yields can be locked in for Core positions I want. Average yield is around 3.3% which will add $79.28 in annual income. My ultimate goal is income replacement using dividends. My dividends must increase every year above the rate of inflation. My core holdings must all have investment grade credit rating and predictable earnings. The yield of my portfolio must always be at least 50% above the S&P500. The target y/y dividend increase of all the companies (averaged) should be around 8 to 10%. Purchases selected for my portfolio must prove to be of decent value at the time of purchase. Slight premiums can be paid for core holdings that will be held for many decades. In addition to P/E screening, I prefer buying a company that has a yield that is above the average past dividend yield. As of the closing on 6/6/2015, my portfolio is still sitting healthily above $100k. With cash I am at $113,007.53 which is over my target goal by 11%. The portfolio took a hit recently as most of my holdings have yields over 3% and interest rates are looking like they will be raised some time in September with the recent jobs report. This drop in value should be celebrated as a buying opportunity. A lot of companies that I have always wanted to own more of have started diving below the SMA 200. An earlier article published on this blog lists some of these companies I am eyeing.
. .. Total w/ cash … …..22 …..2 …..
My income from dividends has increased by $243 since last month. My largest position is still MO and JNJ which I am quite happy keeping that way. I see large growth prospect with Visa which is why it's my 3rd largest holding. If it weren't for Visa's 30 P/E, I would be adding more every week in my automatic investment plan. 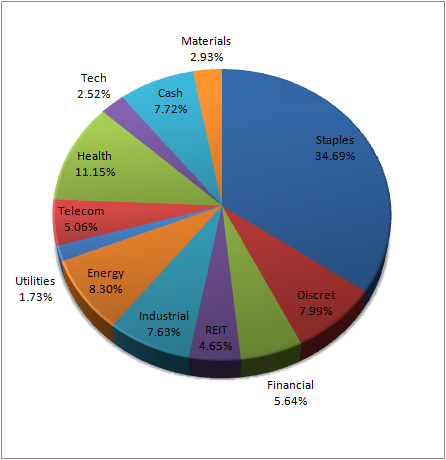 The worst performing sectors recently are my utility and REIT sectors which are sensitive to rising interest rates. Short term positive performance should not be of the focus here as those still in accumulation should cherish stagnant or decreasing share prices of quality companies. Some of the higher yielding consumer staple stocks such as tobacco have taken a hit too. I see this as the start for potential buys (which I have waited a long time for). My heaviest sector is still Consumer Staples and my goal is to keep it that way. In the following weeks I expect many of my consumer staples to grow which include MO, KO, CL, PM, and PG since they are beginning to look more attractively valued for buy consideration. My holdings in utilities are light to my taste but that is because I am waiting for the buying signal for companies such as: D, SO, PNY, XEL, WEC. Out of those listed, SO has the best value today and most margin of safety. My favorite companies are D, SO, and PNY for their earnings & dividend consistency and low volatility. REITs have taken a beating and my high interest targets are Realty Income (O). 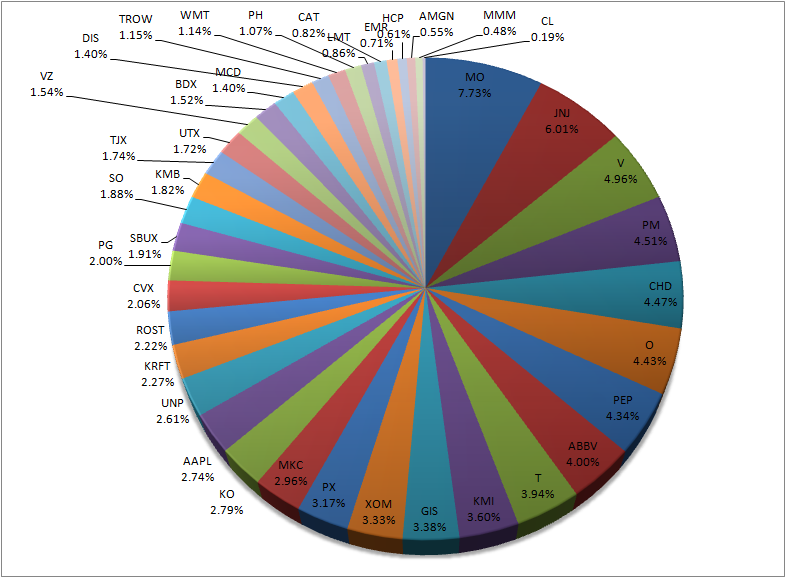 I do not have too much of an interest for others as core holdings, but stocks that come to my mind as speculative or supporting positions include HCN, VTR, WPC, and OHI. REITs to me are higher in risk for me and I prefer not to hold too many high yielding REITs. Like what happened to the Energy sector last year with the crash in oil prices, I feel that interest rate hike worries will force many high quality dividend companies into buy territory. Those with cash on the side ready will be rewarded for being patient.